ENCAPSALL SUPER is a very tough, protective, urethane coating that is especially designed for industrial applications, including secondary containment areas, pipelines, valves and transfer pits. Fortified with micaceous iron oxide, ENCAPSALL SUPER cures to a rubber-like, waterproof, seamless membrane that possesses exceptional strength and elasticity. Can be used over stucco, mineral composites, fibreglass composites, insulation, non-porous stone and other surfaces. All surfaces to be treated must be clean, dry and free of loose debris, oils, grease and any substance that would interfere with proper bond. A careful inspection of the surface should be made to detect any signs of damage or defects and all repairs should be completed before application of product. Porous surfaces and certain bituminous surfaces require a priming coat. Surface must remain at least 5°F above dew point during the application and curing process. ENCAPSALL SUPER may be applied straight from the pail using brush, roller, or spray technique after 2 minutes of slow power stirring. 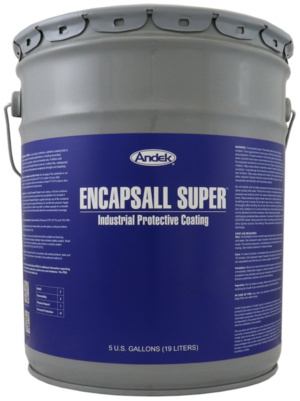 ENCAPSALL SUPER is applied in 2 coats at a thickness of 16 wet mils per coat. If it is necessary to exceed 16 wet mils per coat OZ CATALYST may be added to the ENCAPSALL SUPER. Approximately 4 hours at 70°F and 70% RH. Approximately 24 hours at 70°F and 70% RH. Tools may be cleaned after use with Xylene or Toluene. 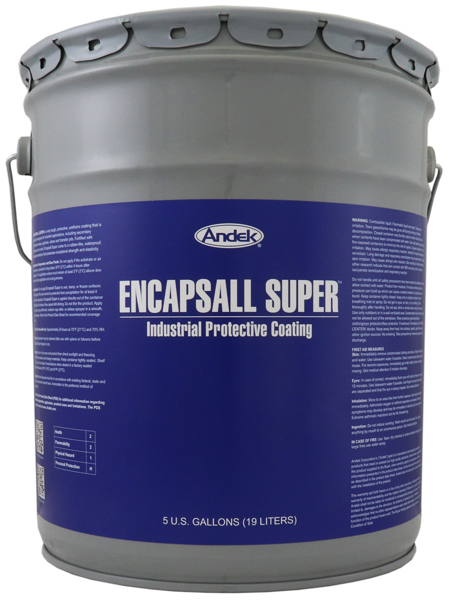 To prevent chalking or discoloration of the surface Andek recommends an application of WEARCOAT 66 over the ENCAPSALL SUPER. Keep ENCAPSALL SUPER pails away from direct sunlight. This product is a moisture-curing urethane and is packaged in specially sealed and air excluded drums. If damaged, air and moisture vapor may enter and cause premature curing. Care should be taken to avoid creating part full containers.